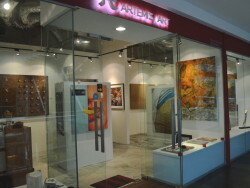 Our original gallery location, at Block A1 of Solaris Dutamas, which was home to Artemis Art from our inception in 2011 until the end of 2012. Artemis Art is a young gallery specializing in artworks from up and coming artists from Malaysia and the surrounding Southeast Asia region. Our primary focus is on young Malaysian artists and emerging Indonesian artists, and we are gradually expanding our coverage to works by artists from other parts of the region. 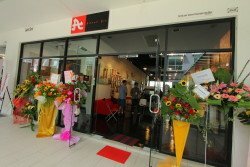 Our aim is to be a gallery known for our Southeast Asia focus, something we hope to achieve in the years to come. We began collecting art since way back in the mid-1990s, based purely on our love for the arts. But the journey that has culminated with the opening of Artemis Art began more recently with a trip to Yogyakarta in 2008. Apart from visiting the city to view the ancient splendour of Borobudur and Perambanan, our trip there was also to look at contemporary art, that Yogya is well-known for. Needless to say we were very impressed with what we saw. Yogyakarta, incidentally, is home to over 100 universities, one of which is the prestigious Indonesia Institute of the Arts (or Institut Seni Indonesia), better known as ISI. Most of the artists we met were either studying at, or had graduated from ISI, and the institution has produced a number of established artists, such as Maria Indria Sari, Soni Irawan, Farid Stevy Asta, and countless others. ISI is regarded by many to be the best fine arts institution in the region. The numerous trips to Yogyakarta allowed us to get to know our artists better, both as artists and as ordinary individuals with daily commitments and responsibilities towards their families. We were humbled by their less than plentiful lives, and yet showing unwavering commitment as artists, creating a better place for us through their expression in art. We therefore decided to play a small role in their journey to continue exercising their freedom of expression through art, by buying their art works as encouragement. We are proud and happy to know that we have helped, in a small way, to release them from some of their financial burdens related to, for example, purchase of art materials, and studio rental costs, so that they can better concentrate on their craft. One of the key reasons why we started Artemis Art is to help young and struggling artists – wherever they may be – inspired by our friend (and agent) in Yogyakarta, a gallery owner who has helped many young artists find their footing in life, allowing them to continue with their craft. It is through him that we assisted the artists in Yogya, and it is his noble work that we are trying to emulate. By sharing these art works with the public, we hope to inspire more young artists to express themselves freely through art and also allow us to continue to support these artists financially by enabling us to continue buying their art works and helping set up exhibitions for them, allowing more exposure for their work and talent. When our clients invest in these art works, they, too, contribute towards helping these struggling artists, and help them to keep on going, doing what they do best – seeking to create a better place for all of us through their art. 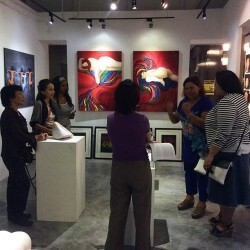 In the area of art promotion, in addition, Artemis Art participates in international art fairs, especially those outside of Malaysia, as a means to provide broader horizons for the artists we work with. We look forward to seeing you at the gallery in the near future, and welcome any feedback on how we can help make the Malaysian art scene more vibrant.